As Paul Feig's reboot of Ivan Reitman's classic sci-fi-horror-comedy readies to hit theaters, we're looking back at the film that started it all. 1. DAN AYKROYD FOUND INSPIRATION FOR THE MOVIE IN HIS FAMILY'S HISTORY. Dan Aykroyd grew up surrounded by spiritualists. His great-grandfather, Samuel A. Aykroyd, was a noted nineteenth century psychic investigator who conducted séances at the Aykroyd family farmhouse in eastern Ontario with a medium named Walter Ashurst. This predilection for the paranormal was passed down to Aykroyd’s grandfather, Maurice, who was an engineer for the Bell Telephone Company. Maurice allegedly tried to use his know-how to create a high-vibration crystal radio that could contact the spirit world. Dan's father, Peter, kept a sizeable library of books about spooky subjects (including his great grandfather’s séances), which kept ghosts and ghouls in the back of young Aykroyd’s mind. After he left Saturday Night Live in 1979, he read an article about parapsychology in an American Society of Psychical Research publication, which inspired Ghostbusters. 2. GHOSTBUSTERS COULD HAVE BEEN MUCH DIFFERENT—AND MUCH BIGGER. Aykroyd found comedic inspiration in films like Bob Hope's The Ghost Breakers, the horror-comedies of Abbott and Costello, and Bowery Boys fare like Spook Busters and Ghost Chasers. He went wild writing his original script, which took place in the future and had a much darker tone. The actors he had in mind for the three main protagonists were himself, John Belushi, and Eddie Murphy. His concept involved dozens of Ghostbuster groups fighting specters across time and different dimensions. The now-iconic Stay Puft Marshmallow Man—which is in the climax of the finished film—appeared much earlier (on page 20) and was one of 50 large-scale monsters that the Ghostbusters would do battle with. Eventual director Ivan Reitman estimated that the first script would have cost up to $300 million to produce—and that was in 1984. 3. JOHN BELUSHI STILL APPEARS IN THE FINAL FILM, IN SPIRIT. 4. THE MOVIE HAD TO BE MADE IN A VERY SHORT PERIOD OF TIME. Once Aykroyd nailed down the general concept and the narrative of the film (but before he'd penned the final draft), he brought on Ivan Reitman, not only to direct, but also to sell the movie to a major motion picture studio. Reitman had previously directed the popular Bill Murray comedies Meatballs and Stripes—both of which had been co-written by another eventual Ghostbuster, Harold Ramis. Since Reitman had a relationship with Columbia Pictures (which produced Stripes), he approached pragmatic studio head Frank Price with Aykroyd’s outrageous one-sentence pitch—“Ghost janitors in New York”—in May 1983. While admittedly skeptical, Price was attracted to the project because the tripartite of comedy geniuses who had agreed to play the leads: Aykroyd, Murray, and Ramis. Price asked Reitman just how much the outrageous-sounding movie would cost, and the director allegedly threw out a random guesstimate of $30 million. Price agreed on the budget and the movie with one stipulation—that it must have a firm release in June 1984, in time for the summer season. This was no small detail, considering this gave them only 12 months to finish the script, shoot the film, and create and finish the special effects. The rushed production schedule immediately forced Aykroyd, Ramis, and Reitman to retreat to rented houses on Martha’s Vineyard for a marathon three-week writing session to complete the final shooting script. Afterward, they immediately began prepping the shoot and scouting locations. 5. SIGOURNEY WEAVER GAVE A UNIQUE AUDITION. Despite the fact that the film began production with its three leads already cast, Reitman needed the right actress for another vital part of the film. For the role of Venkman’s headstrong love interest, Dana Barrett, Reitman chose Sigourney Weaver. She was eager to do a comedy after her amazing performance as Ripley in Ridley Scott’s Alien, so she tried something altogether different for her audition. She offered up a wordless scene where she turned into one of the grotesque dogs that do Gozer’s bidding, an act that allegedly involved writhing across the casting couch and loudly snarling at Reitman. The director was impressed—if not a little scared—and she got the part. 6. THE PART OF LOUIS TULLY WAS ORIGINALLY WRITTEN FOR ANOTHER SECOND CITY ALUM. For the loveable loser-turned whacked-out demon “Keymaster of Gozer” Louis Tully, Aykroyd thought of actor John Candy. The Canadian comedian had previously worked with him in 1941 and The Blues Brothers; with Reitman, Ramis, and Murray in Stripes; and for Ramis again in National Lampoon’s Vacation. But Candy envisioned Louis as a stern German man with a thick accent who kept dozens of dogs in his apartment. He also wanted the character rewritten and made into a starring role. Filmmakers preferred the original character that Aykroyd and Reitman had developed, so they gave the role to another member of the Second City troupe, Rick Moranis. The soft-spoken, bespectacled comic brought his own brand of misfit comedy and improv styles to the now-classic character—and he also provided his own wardrobe. 7. "EGON SPENGLER" WAS INSPIRED BY A FRIEND, AN INTELLECTUAL, AND AN UNKNOWN. When trying to come up with the perfect name for his character—who was the brains of the Ghostbusters—co-writer Harold Ramis combined both personal and academic inspirations. “Egon” was the first name of Egon Donsbeck, a Hungarian exchange student at Stephen K. Hayt Elementary School who was Ramis' classmate when he grew up in Chicago. “Spengler” came from German historian and philosopher Oswald Spengler. For the "look" of his character, Ramis copied the style of an unknown guy he'd seen on the cover of an abstract architectural journal. He thought the man’s old three-piece tweed suit, wire-rim glasses, and puffed-up hair were perfect for his geeky parapsychologist. 8. GHOSTBUSTERS IS THOUGHT OF AS A NEW YORK MOVIE, BUT SOME SIMPLE MOVIE MAGIC WENT INTO MAKING ITS VARIOUS LOCATIONS. Come to New York and you can visit some key Ghostbusters locations. 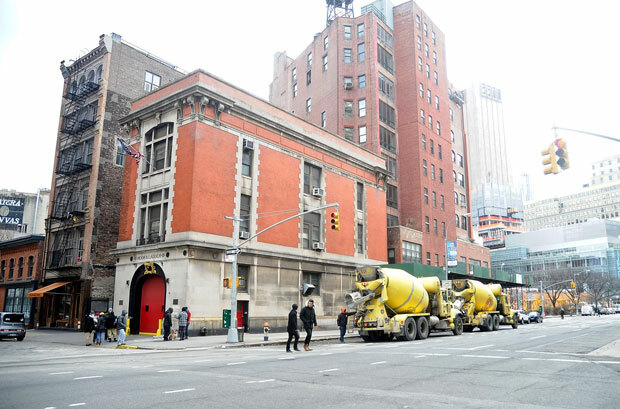 The exterior of the fully functioning FDNY Hook & Ladder #8 building at 14 North Moore Street in TriBeCa served as the Ghostbusters’ base of operations—definitely not a “demilitarized zone,” as Egon said. The building at 55 Central Park West housed the apartments of Dana Barrett and Louis Tully. The main branch of the New York Public Library at Fifth Avenue and 42nd Street is recognizable for the lions guarding its entrance, and Columbia University’s Havemeyer Hall served as the Weaver Hall Department of Psychology building that the guys are kicked out of at the beginning of the movie. Then there’s the legendary restaurant Tavern on the Green, where Louis was attacked by one of Gozer’s dogs. But none of these places appear exactly as they do onscreen. The interior of the Ghostbusters' firehouse was actually an abandoned fire station in Los Angeles, and the rooftop temple scenes at Dana’s apartment were filmed at a huge set built on Stage 16 at Columbia Pictures (large-scale matte paintings were used for long shots). The early library scene where Egon is introduced was in fact filmed at the New York Public Library, but the scene where the three Ghostbusters come across the old librarian ghost in the stacks was actually shot across the country at the Los Angeles Public Library. Similarly, the Sedgewick Hotel—where the guys bust Slimer—wasn’t in New York at all; the exterior and interior shots were taken at the Millennium Biltmore Hotel in Los Angeles. 9. THE ECTOMOBILE WAS ONE A KIND—AND THEN IT BROKE DOWN. Out of the handful of iconic details from Ghostbusters is the Ectomobile, a 1959 Cadillac ambulance outfitted with gadgets and gizmos to help the guys bag pesky poltergeists. In a typical movie production, several similarly-adorned vehicles are used for stylistic and insurance purposes. (The production of Back to the Future, for instance, used three different DeLoreans.) Because the filming of Ghostbusters was so rushed, only one Ectomobile was put together. Naturally, everyone on set was very cautious around the then-25-year-old jalopy. While they handled the ambulance with care, the car broke down at the end of a shot of the Ecto driving across the Manhattan Bridge. Luckily, this didn't happen until after main production wrapped in New York City, but still, the car was DOA and wasn’t available for use again. 10. ONE VISUAL EFFECT SHOT OF SLIMER INVOLVED SOME SPRAY PAINT AND A PEANUT. 11. DIRECTOR IVAN REITMAN MADE A COUPLE OF UNORTHODOX APPEARANCES IN THE MOVIE. You won't see Reitman in Ghostbusters, but still, he does have a presence: For the noises of Slimer pigging out on a pile of food before he famously slimes Peter Venkman, Reitman stepped in to provide the gross-out grub-gorging sounds. Reitman’s naturally deep voice also proved perfect for the moment when Dana becomes possessed and says “There is no Dana, only Zuul,” which was later enhanced with special effects for a truly spooky result. 12. BILL MURRAY'S CADDYSHACK CHARACTER, CARL SPACKLER, APPEARED IN ONE SCENE THAT WAS CUT. It isn’t specified, but the voice and mannerisms of the character that Murray plays opposite Dan Aykroyd in this deleted scene is eerily similar to Carl Spackler, the lowly groundskeeper he portrayed in the 1980 comedy masterpiece Caddyshack (which was directed and co-written by Harold Ramis). The scene was cut for time, mostly to get to the scene where Louis Tully is attacked by the demon dog chasing him, but one doesn’t have to wonder what it would have been like if the worlds of Caddyshack and Ghostbusters had collided in such a fashion. 13. ONE OF THE FILM'S PRODUCERS CREATED THAT ICONIC LOGO. The most indelible icon from Ghostbusters is the famous “no-ghost” logo that appeared on the guys' car, their uniforms, and widely among advertisements and promotions for the movie. Associate producer Michael C. Gross, a bit of a renaissance man, designed the image. Prior to getting into the movie business as a producer, Gross served as an art consultant for The Muppets, John Lennon, and The Rolling Stones. He also served as art director for National Lampoon and Esquire in the 1970s. 14. PRODUCTION SHUT DOWN CENTRAL PARK WEST, AND ISAAC ASIMOV WASN'T PLEASED. While shooting exteriors in front of Dana’s apartment building, the production had permission to temporarily shut down traffic in the area surrounding West 65th Street and Central Park West. What they didn’t know was that it would disrupt traffic throughout Manhattan. During rush hour, cars backed up to Columbus Circle, eventually going all the way downtown. In fact, Aykroyd was concerned that they had inadvertently pushed the traffic jam all the way to the Brooklyn Bridge. After receiving complaints, cast and crew members jokingly told others that the delay was caused by Francis Ford Coppola’s production of The Cotton Club, which was shooting in New York at the same time. One particularly ornery Upper West Side resident who complained was author Isaac Asimov, who stumbled on to the set and told Aykroyd that they were “inconveniencing” him. Aykroyd, a lifelong fan of the writer, smoothed things over by using the opportunity to lavish praise on the irritated Asimov. 15. “CROSSING THE STREAMS” WAS MADE UP ON THE SPOT. The deus ex machina of the Ghostbusters crossing the streams of the proton packs helped them to—spoiler alert—defeat the Marshmallow Man and the evil demon Gozer at the end of the film. According to Ramis, this activity didn't appear in script. 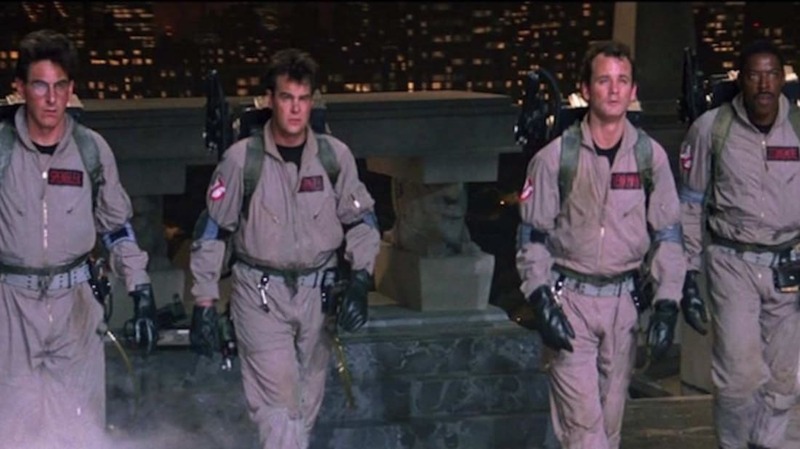 He and Aykroyd were unsure how to get the Ghostbusters out of the final scene alive, and because the nuclear technology behind the proton packs was “explained” with humorous techno-babble and mostly left up to the audience’s imagination, they came up with the idea of crossing the streams—an act which would somehow cause a cataclysmic shift in our dimension. After this decision was made, they added in some foreshadowing of the event to an earlier scene, only to revisit the concept in the climactic standoff at the end. 16. ON SET, THE MARSHMALLOW WAS REALLY SHAVING CREAM. Once the Ghostbusters cross the streams, the rift between the two dimensions causes the Marshmallow Man to explode, raining down marshmallow on the unsuspecting New Yorkers below. But getting that amount of actual marshmallows to dump on the film’s extras was implausible. Instead, Edlund’s team collected 500-gallon batches of shaving cream to substitute for the remnants of Mr. Stay-Puft. William Atherton, who played EPA villain Walter Peck, was skeptical about having such a large amount of heavy cream dropped on him, so they tested the idea on a stuntman using only 75 pounds, and it knocked him to the ground. The stuntman was okay, and another smaller batch was collected to dump on Atherton for the final take in the film. 17. THE MOVIE ALMOST HAD TO CHANGE ITS NAME. Once production wrapped, Reitman faced a situation that would possibly have derailed the whole movie. In the 1970s, Universal Studios had produced a live-action TV series titled The Ghost Busters, and their lawyers threatened legal action if the name of the movie wasn’t changed. Reitman, who had shot footage of the leads referring to themselves as the Ghostbusters and of massive crowds shouting “Ghostbusters! Ghostbusters!” was in deep trouble. Luckily, Frank Price—the head of Columbia Pictures and the man who originally green-lit the movie—was moving to Universal Studios to become the new studio head there, and allowed Reitman to keep the name for the film. But the legal snafu reared its head again when a TV cartoon was made out of the movie. To satisfy Universal, the Saturday- morning fare was labeled The Real Ghostbusters, so as to not legally confuse the two properties. 18. HUEY LEWIS WAS NOT A FAN OF THE THEME SONG. Because his song "Holiday Road" was featured prominently in National Lampoon's Vacation (directed by Harold Ramis), Fleetwood Mac guitarist Lindsey Buckingham was allegedly approached about a theme song for the film, but he passed on the project. Reitman hoped that Huey Lewis & The News would take the job, and even used their hit “I Want a New Drug” as a temporary filler song while cutting the film. Lewis declined as well, because he had already agreed to contribute the song “Back in Time” to Back to the Future and didn’t want to do any more soundtrack work. The filmmakers then approached Ray Parker Jr., who had sung hits with Raydio ("Jack and Jill") and was finding success as a solo artist as well. Unfortunately, the titular tune—with the often quoted “Who you gonna call?” and “I ain’t afraid of no ghosts!”—bore a striking resemblance to Lewis' "I Want a New Drug," so much so that the song's publishers sued for plagiarism. The suit was settled out of court, but you can decide for yourself with the mashup of the two songs above. 19. ELMER BERNSTEIN EXPERIMENTED WITH NEW INSTRUMENTS ON THE SOUNDTRACK. Composer Elmer Bernstein wanted to go beyond a conventional orchestra for Ghostbusters, so he used both new and old technology. He included the then-cutting-edge Yamaha DX-7 synthesizer to create weird sounds that orchestral instruments couldn’t conjure up, and even employed an Ondes Martenot—a relatively obscure early electronic instrument created in 1928 by inventor Maurice Martenot—for additional otherworldly tones. You can hear it in the beginning and middle of the song above. 20. IVAN REITMAN WAS PETRIFIED DURING THE FILM'S FIRST TEST SCREENING. On paper and out of context, Ghostbusters was an admittedly outrageous prospect for a feature film. During the movie’s first test screening, held for 200 random people at Columbia Pictures Studio only three weeks after principal photography wrapped, Reitman was utterly terrified. He was not only uncertain about the fundamental plot of the film, he was also concerned that perhaps-too-absurd major details (like the Marshmallow Man) might take audiences "out" of the movie. In addition, only one fully-completed effect shot was available for the test screening—one of the film's opening scenes, where an old librarian ghost transforms into a frightening ghoul. Reitman waited in the wings during the scene, and when audiences burst out laughing one second and hid their eyes the next, he knew that his fears were unfounded. And Reitman knew he had a major hit on his hands while walking around New York City during the second week of the film’s release, where he saw street vendors selling bootleg Ghostbusters T-shirts.